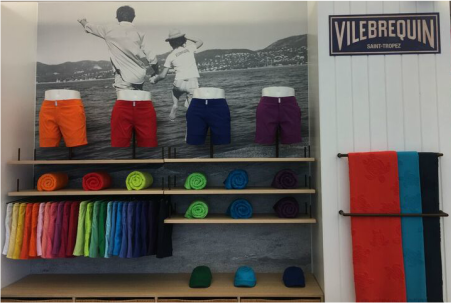 Fashionably innovative swimwear brand, Vilebrequin, has just debuted their Spring/Summer '17 collection to the press. The full collection will be available in stores and online in October of this year. The theme of the collection is “Zen Asian”. Many prints and patterns used throughout the collection are inspired by Asian artwork. The playful patterns and advanced designs make this collection the ideal vacation wardrobe for the entire family. The men’s swimsuit collection features geometric prints and abstract prints with various animals such as turtles, fish, shrimp, sea horses and pandas. Limited edition embroidered styles are included as well with the same “Zen Asian” aesthetic. The men’s swimsuit collection consists of two different types of fabrics, quick dry and regular. Quick dry fabric is a lighter material and packable; each pair of swim trunks can fold into itself using the back pocket. Each suit with a tie waistband features a sterling silver aglet as well. The collection also includes one water reactive style, blue swim trunks with water reactive pandas. The panda design shows up as the swim trunks come in contact with water and the design disappears as the water dries. Vilebrequin is the originator of the Father/Son concept. Swim trunk designs in the men’s line are available in the boy’s line as well so that Fathers and Sons can match. A notable pairing is the polar bear pattern for vacationing during the winter. The women’s swimsuit collection features various prints including fish and plant prints in association with the “Zen Asian” aesthetic. The girl’s swimsuit collection features more teals, pinks and purples. A few patterns overlap throughout the entire collection and for the whole family. For example, the hexagonal anchor print is available in bathing suits, pants, shirts and handbags. It is clear that Vilebrequin is all about versatility. There are several items in the collection that have multiple uses. For men and boys there are swim trunks that double as casual day-to-day wear shorts. For women there is a skirt that doubles as a maxi dress and a cover-up that doubles as a dress. Accessories such as flip-flops, hats, towels and t-shirts with the patterns of the collection are available as well.